This year I toddled off for my holidays in early July. I rather innocently termed this break my ‘summer’ holiday, as it happened to fall at a time of year when the earth’s axial tilt during its annual orbit of the sun produced longer daylight hours and historically higher average temperatures. Sadly, I decided to go to West Wales and the number of sun-kissed days was minimal to say the very least. My overriding memory was sitting on the open deck of the Skomer ferry, in shorts and a gortex jacket, head pulled down inside the collar, breathing into my chest in a fruitless attempt to keep warm in the heaviest rain I have ever experienced. Looks like I chose the wrong summer month to take a beach holiday, I should have booked October! For the past three days I have spent each lunchtime and afternoon with picnic, daughter and snorkel on Exmouth beach, making the most of the splendid sunshine; temperatures into the high twenties and more time spent splashing about in the waves chasing sandeels than the rest of the year put together! Indeed, much of East Devon had the same idea as me and the beach at Exmouth more closely resembled the Monaco Riviera, than good old England! People lay strewn across the beach, the sun beat down and baked the golden sand and the air was filled with a din of engines that sounded like a Grand Prix was being held around the Pole Sand; The only grit in my Indian Summer sandwich. With heatwaves an all-too transient phenomenon in high summer, let alone October, everything was put on hold at home as the beach shelter was dragged out from under the stairs, picnic box dusted down and filled with portable offerings, and the swimmers dug out from the back of the drawer. This was too good to miss. Unlike the summer, where water temperatures are several degrees cooler and a normally warm air temperate exasperates this difference, my two-year old daughter was comfortable in the water for far longer than her dad and we spent most of the afternoon wading about in the rockpools on Maer Rocks looking for creatures. Bit of a busman’s holiday for me as I do exactly this activity as a core part of my ranger work 9-5, but I do it because I love it and to see my own child enthralled by a beadlet anemone and giggling hysterically at a hermit crab made for a perfect day. The heatwave was also good enough to coincide with some of the lowest tides of the Autumn too. This meant lower parts of the shore were accessible for a few hours and new pools and kelp beds were within reach. In Ellie’s eyes we hit the jackpot when I turned a rock and beneath it lay three small common starfish. Each was about 5 centimeters across and we studied them for so long, the tide began to rise before I could persuade my daughter to return hers under a crevice and go back to the rug to warm up! While she huddled under a towel with Mum, I put on my snorkel and short wetsuit (typical boy, I feel the chill) and dashed back in to watch the incoming tide from underwater. This is something I have been meaning to do all year, and the Autumn is definitely the time of year to experience this thrill. I first went for a bit of a drift, riding the strong current down the beach over kelp beds dotted with golden sandy banks. Even on an incoming tide, the current of the exiting Exe is hard to subdue. Pale sand gobies sat prominently on the sun-dappled sand in small groups, heads raised as they pushed themselves up on their pectoral fins. As long as I didn’t make a swimming stroke I could drift overhead without them shooting off. A flounder spotted my approach and flapped-up a cloud to disguise its escape, however by moving very gently, I was able to find it again lurking under a stout kelp frond. Its two bulging eyes circled about wildly, to get a fix on me, before I let go of the kelp and I carried on along my leisurely drift. Looking directly ahead, shoals of sandeels and smaller silver fish, possibly young whiting, darted on the edge of visibility in the clear water. To get anywhere near these fast moving fish I needed to paddle strongly and I was enjoying being carried along too much to bother with all that effort! All this took place in water no deeper than 4 or five feet, often considerably shallower. There’s no point going deeper than this, as the interesting stuff to see, within range of water clarity this close to the estuary mouth is in the shallows. I turned and front-crawled my way back up the beach against the current to my start point just off Maer Rocks and held on to a large Lamanaria kelp to fix myself in position. While doing this, I likened myself to a big grey seal, settling myself in position for an afternoon snooze. However, compared to the seal, I was a wallowing lummox. As the tide rose, so sand gobies flitted about on the seabed below me, nodding and posturing to each other as they dashed over the sediments in search of food. Hermit crabs trundled along the edge of the rock next to me, not venturing too far out into the open, lest they were spotted by a passing cuttlefish. I stayed there as long as I could, the sandeels remaining stubbornly on the periphery of view, before running back up the beach to share my experience with the family. If the last 7 years as a ranger has taught me anything, its that you have to seize the moment when wildlife watching, and this weekend was certainly a case in point. Now, where did I put those dust sheets and paint roller… back on with the DIY! Where to begin? Firstly, a quick apology for the hiatus of last week, a sheer volume of events through the week and the previous three weekends meant that I was unable to meet the copy deadline and sadly missed our weekly wildlife rendez-vous. However, the upshot of all these events is an amazing collection of unusual wildlife sightings, all shared with families and friends throughout the district. And the good news for me is that many of the participants had smart phones or cameras (how charmingly retro) with them and happily shared the picture prizes. Most recently a grey and mizzly morning rockpooling at Sidmouth’s Jacobs Ladder beach turned up not one, not two, or indeed three, but four amazing arthropods. Sea spiders. I remember first encountering these gangly little creatures in a marine zoology unit of my degree course, they are so strange that once met they will never been forgotten. 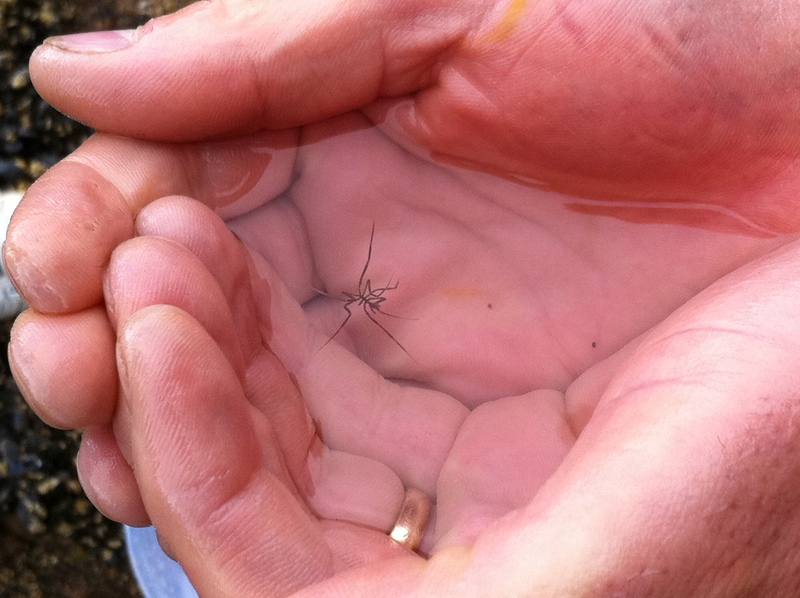 Easily overlooked as a piece of algae, sea spiders are weird creatures! Despite being called spiders, and belonging to the arthropod group, these animals are not arachnids and their eight-legged resemblance to the terrestrial and aquatic true spiders is purely chance. The odd thing about sea spiders is that they have no respiratory system, instead they make use of their high surface area to volume ratio to allow passive gaseous exchange to provide oxygen. This means that they must have extremely clean skin, and indeed their exoskeleton is unusual in being sterile, something which many scientists are interested in studying; being able to find out how they maintain bacteria-free skin in the sea could have huge benefits for shipping. Sea spiders in our waters tend to be found in rockpools, hanging on to tiny tree-like algae, on which they hunt for tiny anemone prey. However, they are not found often, in seven years rockpooling the East Devon coast with schools and families, I have only found one before now. On thursday morning we found four! Last weekend was Escot’s annual “Messing about on the River” event, a feast of old-fashioned netting for sticklebacks and eels, while Alan Bruford indulges in a spot of gold panning with families. We smile and nod enthusiastically, but know this is merely a ruse to satisfy Mr B’s appetite for getting muddy! A good haul of fish were caught by Jim and myself, including young brown trout, which the river Tale has been praised for this year. 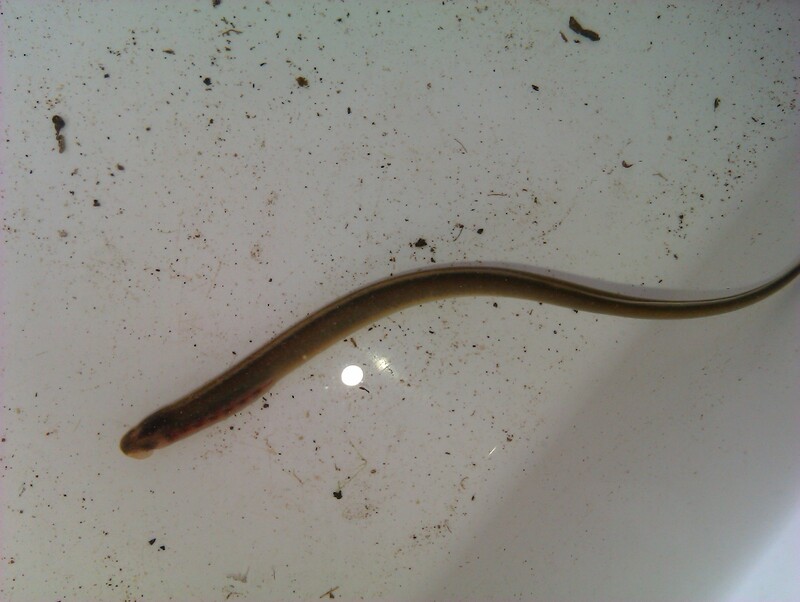 Amongst the bullheads, stone loaches, sticklebacks and eels were two fish which looked like eels. On closer inspection they had no eyes, pores rather than gills and no complex fins. These weren’t fish, but the larvae of a fishy-type animal called a Lamprey; these were ammocoete larvae! Lamprey were once common and prized for the table, indeed King Henry I was so fond of the meal he contracted food poisoning ascribed to consuming “a surfeit of lampreys”. They have become far less common since 1069, though and this was the first time I had seen one of these animals! Lamprey are put in a group alongside fish, rather than being a true fish, and apart from having a free-living large larva they are very different to fish in a number of ways. Firstly they have no jaw, just a round mouth covered in amazing rows of sharp teeth. They live for many years as larvae, before heading off to sea to grow into adulthood. They are the most primitive vertebrate and all animals with backbones are thought to have evolved from a lamprey common ancestor, which means us! Finally the previous weekend saw a mammoth natural history survey of the Axe Estuary Wetlands, with a variety of experts assisting us with a BioBlitz! The Field Studies Base provided our HQ for the day, while experts spent the day rootling and tootling about the wetlands identifying their particular groups. We have reams of records now to show for the efforts, all of which will be added to what we know about the site and help in our efforts to improve them for biodiversity into the future. A first for Devon in 60 years was discovered with the discovery of a larval 13-spot ladybird by ladybird expert Richard Comont. This rare ladybird dies out in Britain each year and is thought to recolonise from the continent. A breeding colony in Stafford Marsh would indeed be a turn up for the books! Richard also found the poster child for the day, by discovering a fabulous puss moth caterpillar in the accompanying photo. This larva of the white fluffy puss moth (puss as in kitten rather than putrified mucus!) looks like it should live in the tropics, and it is seldom seen here despite being quite common. The thing is, even though they are lime green with a pink face, purple back and two red tendril tails, they spend their time feeding in willow, sallow or poplar trees and are normally well out of sight. These caterpillars were feeding on a willow sculpted maze constructed on the wetlands and played amongst by hundreds of children this year. All the while we were unaware of the presence of this wonderful caterpillar. After we spotted these two the maze was given further scrutiny whereupon poplar hawkmoth and eyed hawkmoth caterpillars were found too! Its amazing what is there, living under your nose, if you just stop a while to look! Last week I was stationed on the beach at Orcombe Point for the day, while classes from Withycombe Raleigh and Bassets Farm Primary Schools joined me for a super-quick exploration of the seashore. During the course of a 20 minute workshop, I was not expecting anything particularly unusual to appear, but how wrong I was. As an October introduction to coastal wildlife, we kept warmly to the strand line and looked for shells, after all, the myriad of different shells to be found on the beach all have clues to their ecology hidden amongst them. And its a lot more comfortable than standing in a rockpool all day in the late Autumn! Quite a few shore crab shells were found, some cast skins and some dead and smelly crabs. But then someone handed me this handsome fellow – a large hermit crab cast: exceptional! Tough-as-boots shore crabs will shed their shells which can persist in the immediate area for weeks in calm weather. However hermit crabs have a much more delicate shell and, because of this, are far less frequently seen as casts. The abdominal section of this cast was not present, this is far too flimsy to survive washing ashore. However the legs, armoured claws and thorax carapace were all present and correct. Spontaneity is everything when dealing with education in the natural world, no amount of planning would have prepared me for finding this species in the activity I was leading, but the group spent a valuable session comparing the two species of crab for similarities, differences and discussions about crustaceans ensued. We were even able to sit these shells alongside the stony excrescence of a barnacle and attempt to see connections between these two distant relatives! The autumnal sunshine blazed through the day, making this one of the warmest beach visits I have carried out at any time in the year, perhaps it would have been bearable in the water after all? If you have a spare hour or two this weekend, why not head down to the beach and explore the strandline for sea creatures? Every one of the 300 or so 6-10 year olds who joined me last week was thrilled to be out on the sand in the sun, and I know they could have stayed and played all day! As well as visiting the seafront beach, I would urge all of you to spend time admiring the view over the estuary in the next few months too. The brent geese are back and there’s plenty to look out for. Local photographer Beryl Ladd sent me this photo of a dark-bellied brent goose on the estuary, which seems to have a set of rings. I will look into which organisation are running a brent goose ringing scheme and report back when I find out more. Ringing is a means by which ornithologists can gather data about bird ecology and behaviour. Because all birds of the same species look largely identical to our eyes, giving an individual an identity can reveal an enormous amount about the bird and the species. Large birds, such as geese and swans can carry relatively large rings which are visible from distance with a good pair of binoculars. This means that identification can be made of individuals while they are alive and maps created, tracking their movement. Smaller birds carry a tiny metal band on their legs with a serial number, which if found on a dead bird, should be reported to the British Trust for Ornithology, the organisation which administers UK bird ringing. Statistics about length of life, distance travelled and even total distance travelled in a bird’s lifetime have been revealed thanks to the efforts of bird ringers around the world. For example, for many gardens in the region, their ‘resident’ garden blackbird may well be replaced by a European interloper this winter as our bird numbers are augmented by influxes of species from the continent. More news to follow as I uncover it. Sometimes in the course of my rangering duties, pretty often in fact, I have cause to feel very lucky indeed. Last monday was just one such moment. 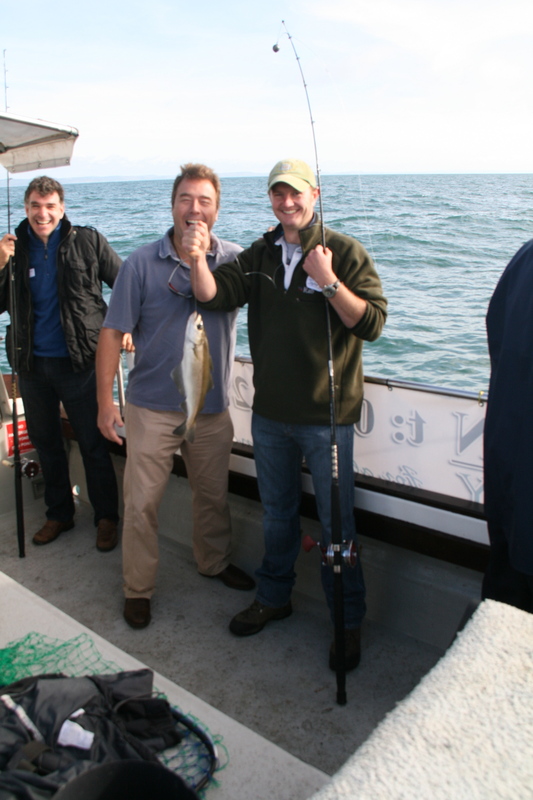 I joined a team of enthusiastic foodies and fishermen on a Catch & Cook event, organised by Dart’s Farm. What a superb day, which showcased our local coast and countryside to its fullest. The day started early with a hearty breakfast, before we trooped down to Exmouth Docks to get on board the Rose Ann for our day on the waves. The weather was superb, a blissfully sunny September morning with the promise of more sun to come. It was a day which put many of the August school holiday weeks to shame. In fact, by the end of our seven hours at sea I had caught plenty of sun as well as fish! 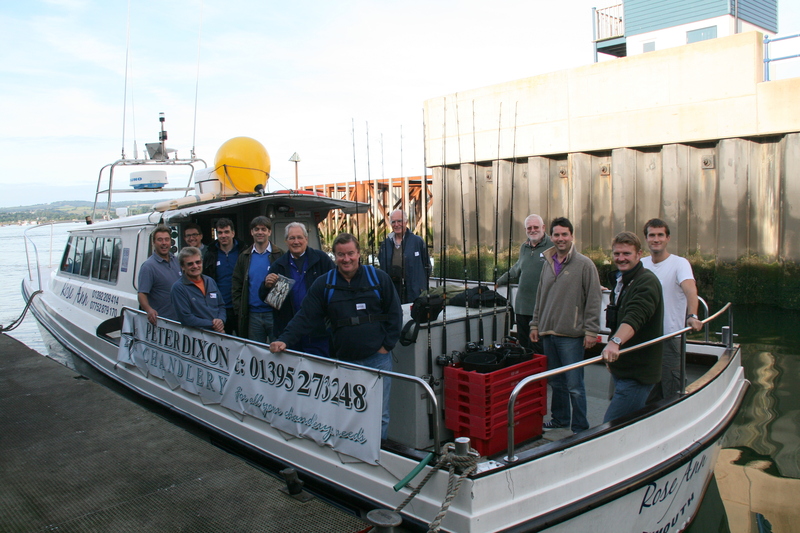 We met Mike and John on board, and set off for the hour’s motoring to the area we were to fish that day. It just so happened that the reef was due south of Seaton, which meant for the first hour we sailed blissfully past the entire East Devon coastline. And didn’t it look magnificent? I don’t get to see it from this angle very often, and by only looking upon the Jurassic Coast from land or a beach, you miss the point considerably. We were about five or six miles off-shore, bouncing along at about 18 knots, and this provided a constantly changing backdrop of cliff colour, shape and activity. The cliffs rippled past like a sinuous wave, with each valley cutting its own cleft to the sea. Leaving the Exe we passed the Otter and Sid valleys, Branscombe vale shot back towards the West, before the Axe cut its way into view. In this time we had travelled past 120 million years of geology and spent the day fishing within site of all three eras. Perhaps this fact was a little lost of my fellow fishermen, and I didn’t want to get on my soapbox, they were here to enjoy themselves! Once over the wreck we were issued with our reels and Ugly Sticks – strange name for a fishing rod, I never did ask why they were so called – and John made his way around the boat getting people ready to drop a line. I was politely last, waiting patiently for the weight to be loaded onto the simple rig and get my hook baited. Its important to point out now my life history of fishing, it wont take long. When I was 12 my grandmother bought me so much tackle, rod, reel, video: the lot. A complete course fishing outfit. I was wide-eyed with excitement when I opened it Christmas morning, before spending many fruitless hours at Cheddar reservoir fishing for pike, perch, rudd, anything! A year later I had given up with not so much as a nibble. And that is pretty much how it has always been with me and fishing. I bought a beach caster and mackerel feathers a few years ago and had one evening on Budleigh beach when I landed three shimmering beauties, but otherwise I had similar luck to my childhood days. I am not much of a fisherman. Today was set to be different though! I dropped my line over the side and, on its way down, the bait was snaffled by a modest sized pollack. I was totally chuffed to have broken the day’s duck and from there I landed two black bream (one was the size of a dustbin lid)and a large(ish) bass. Despite feeling a bit queezy through most of the day, the hours sped past and I couldn’t believe it was already time to head back to land and receive our masterclass in fish preparation from Dave Kurley at the Fish Shed. The first fish of the day! I know Dave from filming the award-winning Think Deep last summer, and he is a mine of information and a natural raconteur when it comes to fish. Everyone got stuck in, filleting, gutting and scaling the fish, while Dave gave the technical low-down on why some fish are left guts in and some have to be gutted as soon as landed. He even showed us how to fillet a flatfish, although i am not sure how many of us will be brave enough to attempt that with a £30 turbot any time soon! The whole day was a celebration of what we have here. Right here on our doorstep. The distinctly French scene of fresh fish being prepared in front of an enthusiastic audience in the open air, was only betrayed by the accents and pots of tea on the tables. The vivid red cliffs were our wallpaper for a day on the bright, brilliant blue sea. The evening meal recipe… well, ok that was French but grilled fish with a simple burre blanc is surely the best way to appreciate four different and toe-curlingly fresh fish, isn’t it? It reminded me, strangely, of my time living in London. It wasn’t until the last week before I moved to Exeter that I let my guard down and allowed myself to do the ‘touristy’ things. Here we were indulging in a day of fishing, which (for the complete ham-fisted novice) could not be bettered anywhere on earth! Sure, apart from the fish there was a disappointing lack of dolphins, and a single guillemot, nine gannets and a skua was nice but not what I would have been looking for on a pelagic birdwatching cruise. But the event shed a beautiful autumn light on this part of the world and confirmed to me why so many people love to come here for their holidays. We are so lucky to call this home. Increasingly people are emailing me photographs of wildlife they see while out and about in East Devon, sometimes for identification, sometimes for comment and often simply for my delight. It’s a lovely position to be in and I warmly encourage anyone to do the same. 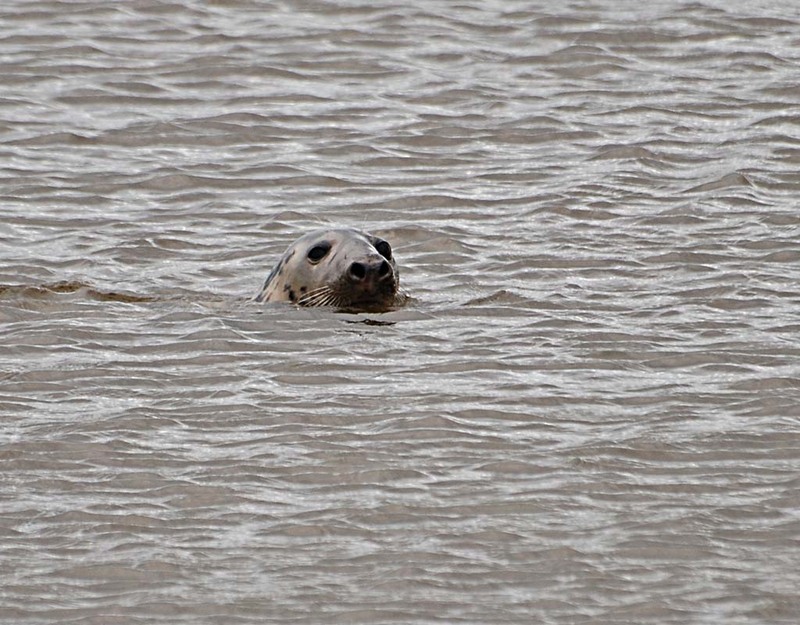 A regular photographer and emailer sent me her photos of a grey seal seen in the upper Exe estuary near the confluence with the Clyst and it spawned the germ of an idea for this column. Marine mammals, whether they are dolphins, whales or seals, always seem to raise excitement in people. I can see why. These animals, which share so many features with ourselves, they need to breath air and suckle their young on milk, however they manage to thrive in an environment so different to the one we are used to. Totally pelagic species, that is to say animals which spend their entire time at sea, have come up with clever ways to sleep whilst swimming along. Dolphins for example are able to switch half their brain off at a time and cruise along on auto-pilot with the other half. This ability means they don’t drown when they doze, a distinct advantage! Seals on the other hand, inhabit that halfway world between the open oceans and land. While they are comfortable diving for fish to depths of 70 metres with dives of up to 300 metres recorded, they still return to land to pup and are often seen sleeping out of the water in a characteristic banana shape. Seals also have the ability to sleep underwater, stopping breathing for up to 20 minutes snooze-time, and wrapping themselves in kelp to ensure they don’t drift off physically as well as metaphorically. It is often a surprise to people that we can see seals along the East Devon coast, and that the Exe Estuary is a particularly good place to see one or two at any time of year. The species of seal we encounter in East Devon is more frequently the Grey Seal, rather than the Common or Harbour Seal. While common seals are far from common in this part of the world, they have the largest distribution of any true seal and populate most seaboards in the northern hemisphere. Grey Seals are only found in three distinct populations. The main population is found along the Eastern shores of Canada and North America, there is an isolated population in the Baltic sea and finally there is our friend here from the Eastern Atlantic. Greys can be identified by their long Roman nose, and nostrils which are almost parallel vertical slits, unlike the common seal’s cute ‘v’ shaped button nose. The types of fish eaten by Grey Seals varies enormously, depending on season and location and all medium size fish, the occasional seabird and shellfish are known to grace the menu of the animal. An animal of this size, chomping away on specimen fish brings them inevitably into conflict with people who want to catch fish, namely fishermen. However they are quite rightly afforded special protection in the UK by the 1970 Conservation of Seals Act, brought in to protect them from persecution. Grey seals pup on secluded beaches between September and November, called rookeries. Females give birth to a single white pup which feeds on rich milk and quickly gains weight at about 1.5 kilos a day. There are many reasons why fast development is necessary, as the female carries out all parenting herself, with bulls having very little to do with the process. As the weaning process begins, the females will mate with one or more males in preparation for the following year. The females then leave the pups, and the rest of the development takes place fuelled by the blubber layer. Having piled on the pounds, the pups shed their white downy fur after about a month, replaced by adult hair and a thick layer of blubber which will keep them warm as they learn to fish for themselves. This lovely photo of a female grey seal gives a good idea of what to look out for if you are not lucky enough to spy one hauled out and banana-ing. The eyes are placed high on the head, so that only a small percentage of the animal is exposed when looking around. *Although my favourite is: What is the largest animal that can single-handedly digest cellulose? Answer: Woodlice. All larger animals utilise symbiotic bacteria in the stomach to breakdown the tough fibrous material. I’ll have a P please, Bob. Sometimes nature can produce truly incredible instances. As this is a column which strives to bring you eyebrow-raising wildlife facts, I turned my attention across the Atlantic to allow me license to pen the dreadful title of this week’s article. A man whose emphysema took a drastic turn for the worse with a collapsed lung, was mightily relived when Massachusetts doctors confirmed a pea plant had sprouted in his lung and caused the collapse. It is thought that a raw pea popped down the wrong tube and ended up in his lung rather than his stomach. In this warm, moist environment the pea decided to have a go at growing! Next thing you know, a blocked bronchus leads to a collapsed lung and the poor chap is fearing the worst. With the pea removed, Mr Sveden has confirmed that the incident will not dampen his appetite for the leguminous vegetable. Last week saw the beginning of the East Devon coastal festival. A rather grand title for what is in effect, me spending time on the beach reveling in our fabulous marine wildlife! As ever, the best creatures were not found by me, but by the families enjoying the beach exploring the pools. A positive constellation of starfish wrecked in the lower rockpools, confirmed thoughts from earlier in 2010, that this is indeed a starfish year. Further spawning this summer is leading to weakened common starfish being swept ashore in a swooning lethargy. A sorry sight, but confirmation that populations below the waves are in fine fettle. The third little cuttle I have ever seen in Devon was fished out of a large pool, once again at Chit rocks in Sidmouth. These cephalopod molluscs are more closely related to slugs and snails but have advanced intelligence and identifiable emotional behaviour. Perturbed at being caught in a shrimp net and placed in a flat white tray, the cuttlefish shot about under jet propulsion, its skin flashing colour from pale white to dark chocolate, however no ink was released so perhaps the little fellow had jettisoned this when it was netted. It is always a tear to put these fascinating little creatures back in the water, but they are simply too clever to keep in a stressful plastic tray for any period of time. As soon as everyone nearby had got a look at the little cuttle, back into a quiet corner of the rockpools it went, hopefully none the worse for its encounter. The fish in question is a tompot blenny, a common sight for scuba divers and a not uncommon fish off our coast, but a rarity in the intertidal fringe of the beach. A family who had been rockpooling at Sidmouth and came over to get their bucketful identified made my day when, low-and-behold, their bucket contained a tompot! At first (and this is a trap I’ve fallen into with bird identification too) I overlooked it as a large and well fed shanny. Impressive, but all too frequently seen. Its not that I am a pessimist, quite the opposite, but I simply wasn’t expecting to see this species in a castleated red bucket. At first it was the large and continuous dorsal fin which made my internal ID key twitch. Being out of the water the frilly appendages on its head were flattened and hard to see, but as I realised what the fish was, I dipped it back into the water and there, on the top of its head, appeared two antler-like fringes. I corrected my first assumed identification immediately and was a babbling mess of excitement as I explained to the appropriately named Marriner family what they had found. This for me is the best thing about rockpooling, when compared to other forms of wildlife exploration. When it comes to birds, you really do have to be a seasoned birder, well versed in all the common species, before you can hope to find those illusive rarities. Sure, the unexpected stroke of luck is always possible – like the legendary nutcracker in a little old lady’s garden – but more often than not, its the same people which turn up the goodies. In the rockpools however, all bets are off. The playingfield is leveled and everyone has an equal chance of finding the little cuttle or tompot blenny to get the pulse racing. I thanked Jason and his children so much for crossing the beach to find me, and a second thanks here in print is fully justified, I doubt that fish will be bettered this summer… or will it? For more information on the East Devon coastal festival visit eastdevon.gov.uk/countryside or call 01395 517557.